…so when I was due a phone upgrade (actually I was due one last April but didn’t get round to it) another iPhone was always going to be my choice. A mate recommended the iPhone 6 plus so I just went with the suggestion. They’re slippy too. I’ve almost dropped mine half a dozen times since I got it yesterday. I feel vaguely ridiculous using it as a phone. 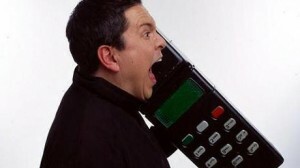 If you ever saw Dom Joly on Trigger Happy TV (see the pic above) you’ll know what I mean. It’s a bit too big, even against my chunky melon. But as a ‘thing’ to work from, browse on and use in a business sense it’s got to be the best iPhone yet in my opinion. The phone didn’t cost me anything as an upgrade except an extension of my existing phone contract, and to be honest it seems as though a phone contract is now as ‘essential’ as a car, cable TV contract and everything else we western softies say we can’t live without, so it wasn’t a hard choice. But this isn’t a phone review, it’s a celebration of NOT being an early adopter. It’s my acknowledgment that I can happily post about getting the newest model iPhone four months after the really hip people got one. And it still works the same. If anything it’s better because the OS has been tweaked and upgraded to fix some of the initial bugs. I suppose I missed out on the initial buzz of being able to flash it about on launch day (yeah right), but then again I can also say I wasn’t one of those tooly-heads who spent three nights in a tent outside an Apple store queueing to buy one. A GREAT bit of marketing Tony – and when my products fly that well I will provide the tents and the Hot Dog Stand to add to the BUZZ!